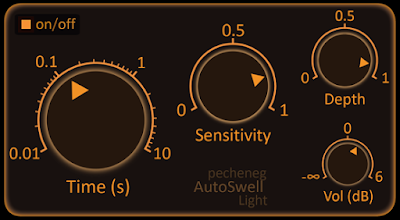 Pecheneg Audio FX: Automatic volume effect - AutoSwell Light - in VST and AU formats. Automatic volume effect - AutoSwell Light - in VST and AU formats. Want yo play guitar like violin but sick of turning a volume knob? Miss your old Boss Slow Gear pedal? Or just want to smooth an attack of your instrument? Let us to present a new audio plugin - AutoSwell Light - an automatic volume swell effect triggered by the input signal. Time: sets the constant time of swell attack. Sensitivity: defines the response to the input signal. Larger value allows you to detect soft and quiet notes. Volume: sets overall volume of plugin. Don't forget to support us :-). Thanks in advance. this looks great, want to try it, and the pro version looks good too. the curves are a great idea. unfortunately the yandex link file does not seem to work for the 64 bit windows dll of the light version (have not tried the others). when I click on the download button it goes to the host, then does nothing. Any other download method available?